The road weather station is intended to provide basic information on weather conditions and the conditions of the road surface, needed for road and highway management especially during the winter months. A sensor cross arm carries a suite of atmospheric sensors. The Road Weather Station consists of light, compact units in hard Aluminium which is quick and easy to install. The mast is supported by a housing, which is bolted to a concrete foundation, and a hinge at the base of the housing facilitates raising and lowering of the station. The road sensors have been specifically designed for the station. 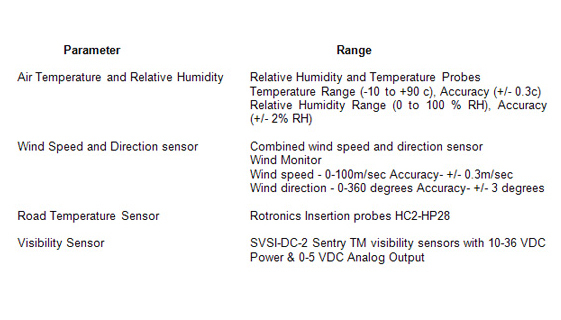 The Road Condition Sensor measures road surface temperature. The collected data is stored to microprocessor unit and downloaded via communication infrastructure.